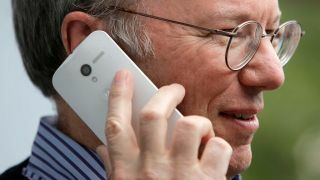 "Isn't allowed to comment on the nature of this phone"
Google's Eric Schmidt rocked up at the Allen and Co media conference with a phone we expect is the Moto X Phone. Sadly, he 'couldn't comment on the nature of' the handset, but was happy enough to wave it around in front of photographers' cameras. He's nothing if not unassuming. The sleek white handset doesn't come with the traditional boxy Motorola stylings - in fact, it looks quite nice and less chunky than previous leaks have suggested it will be. The back panel looks sort of cross-hatched in a similar style to the Google Nexus 4's snazzy jazzy back plate. One reporter, Rachel Abrams, reports that Schmidt insisted, "I'm not allowed to comment on the nature of this phone." So that was useful. If it is indeed the Moto X Phone, we expect that back plating to come in various colours to tick off the whole 'customisable' bend Motorola is going on. Still not too much to report spec-wise, although with the device on show like this we don't imagine it'll be too long before Motorola and Google make the handset official.